Auspicious! Awesome. Amazing. ObamaCare Has Been Approved By the Supreme Court. or What, Are You Crazy, Syte? ObamaCare Has Been Approved By the Supreme Court. What, Are You Crazy, Syte? We knew something was coming. June, 2012 promised to be a momentous month. We were in the third act of a great national drama, in which the definitions of fundamental human rights and liberties could be redefined. Can an American President Mandate? Can he mandate socialized medicine? Can he mandate that all citizens must pay for abortion? For those of us with Faith and Hope, we were praying for an Auspicious month. The Bishops of the United States, realizing that freedom, and especially religious freedom, were in the balance, organized an unprecedented two weeks of prayer and fasting, a nation-wide program known as Fortnight for Freedom. In Madison, Fortnight for Freedom started with hundreds of people praying 15 decades of the rosary on the Wisconsin State Capitol steps. This prayer and fasting program continues as we speak. An unprecedented call for prayer that has been joined by many non-Catholics. Reminiscent of Jonah’s appeal to Nineveh. When it comes to God, Hope does not disappoint (Romans 5:5). Same as Bishop Morlino’s Coat of Arms motto, The Vision does not disappoint (Habakkuk 2:3). The authority of the people of Wisconsin was upheld in the Governor recall election, with a larger margin of approval for the Governor Walker than he had in the original election. The only Governor of Wisconsin to be elected twice in one term! Same wonderful reaffirmation of democracy and responsibility with Lieutenant-Governor Rebecca Kleefisch of Wisconsin. Successful national launching of Fortnight for Freedom; American Catholics gathering for public prayer across the nation, with other faiths joining them in prayer. Supreme Court upholding the right of Arizona to enforce law. Democrats abandoning partisanship to acknowledge that even the head of the Justice Department in the United States (Holder) is accountable to truth and to law. A Federal Judge upholding Florida’s right to remove non-citizens from the state’s voting rolls. ObamaCare approved by the Supreme Court!?! How Can You Still Say Auspicious, Amazing and Awesome? This is where faith and hope come in. God does seem to work this way. When others give up in despair, we of Faith know that God has something up His sleeve. The vision will not disappoint. And it’s likely to be miraculous, something we could not plan and arrange for ourselves. Abraham did not lose faith in God under duress. Moses did not lose faith in God with the Pharaoh’s troops at his heels. I will spare you recounting the numerous times in my life when God stepped in with unpredictable solutions just when things were looking grim. Other than this astounding Supreme Court decision, things are not looking bleak at all– back to the list of victories above! Options still exist for reversing ObamaCare, including the November election. Today, we still have Eric Holder, the nation’s top law enforcement official and right hand man of President Obama, facing a bipartisan contempt of Congress vote over Fast and Furious documents. Holder is a big part of the Obama problem; Holder is responsible for not enforcing immigration policies at the Arizona border, for suing Arizona when Arizona tried to do the job themselves, for suing Florida for their attempts to remove illegitimate voters from the rolls, and for many other challenges to United States law and to our freedoms. Lawsuits by 43 Catholic organizations against the Obama administration’s violation of Religious Feedom are still in process. Numerous Democrats are breaking with partisanship and opposing various aspects of President Obama’s autocracy, by questioning Obama’s competence (Bill Clinton), by holding Obama’s right hand man Holder in contempt of Congress, and by boycotting the Democratic Convention in September. Prayer and fasting by concerned Christians and Jews continues right up to the November election. We are in the midst of Fortnight for Freedom right now. 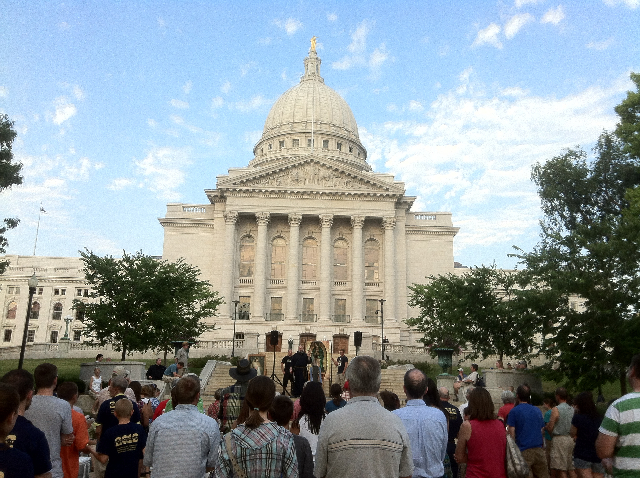 In Madison, weekly Capitol Rosary Rallies will be held through November 1st. There is one today. See you there at 7 PM, State Street steps! The Movie 2016, based on the NYTimes best seller by Dinesh D’Souza and produced by Gerald Molen, producer of Schindler’s List, which projects the devastating effects of President Obama’s economic policies on America, and documents Barack Obama’s anti-American anti-colonialist philosophy, will be released this summer. America will get a remarkable new perspective on Barack Obama, and what his (until now) baffling agenda might actually reflect. The two conventions, Republican and Democrat, and the General Election are still coming. Stay tuned! Back to Bishop Morlino, and the wisdom of his Laetare Sunday message: just before Easter: Difficult week? Rejoice! No leader in the world is powerful enough to thwart God’s Providence – Bishop Robert C. Morlino. Small setback, which might even work in our favor, according to some. We continue to fast, to pray, to work and to hope. I fully expect something akin to the parting of the Red Sea. Equally huge, and equally unpredictable. In 2012, that would translate into something that we did not expect and which stops the marauding Pharaoh and his czars in their tracks. (Forgive the mixed metaphor, I know that Pharoah did not have czars. Tyrants, all of them, just the same. Perhaps the Red Sea that will swallow up the new Pharaoh and his troops might be the new Democrat mutiny that appears to be surfacing, driven by the desire for votes, which cannot ignore the will of the people and the new surge in conservatism reflected in movements such as the Tea Party. We certainly did not plan on or count on that. A Democrat mutiny. What do you know! Who could have predicted that? Or, it might be something completely different. God’s plans can be more surprising than even the Supreme Court’s. Our job is to continue in faith and hope, to fast, pray, remain politically engaged, and VOTE. 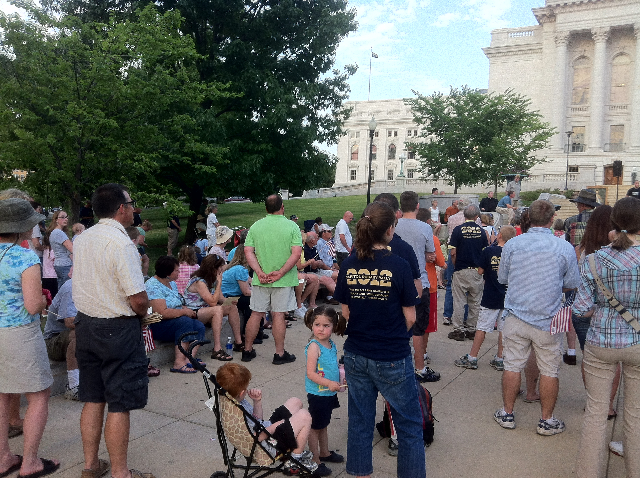 Come, join Catholics at the Capitol Rosary Rally at the Wisconsin State Capitol today! 7 PM, State Street steps. It’s 98 degrees; the heat will be magnifying our prayers! Kneeling to pray 15 decades at the Capitol following the Supreme Court Decision on ObamaCareHundreds gathered to pray the rosary on a 98 degree day. Hundreds gathered to pray the rosary on a 98 degree day.